In TCM Glossy Privet acts quickly for rising Chi. It helps to settle the an inflamed gut, irritable bowel, morning sickness, cough and lung conditions, allergy, intoxication, tumours, seafood poisoning, restless foetus, asthma, chronic bronchitis, vomiting and influenza. It is used mainly to treat menopausal problems, blurred vision, tinnitus, rheumatic pains, palpitations, backache, insomnia as well as to alleviate age-related symptoms. In TCM it is used for maintaining healthy energy, to improve eyesight, nourish the liver and kidneys and promote the growth of black hair. It is a commonly prescribed herb included in formulas to tonify the kidneys and strengthen bone. 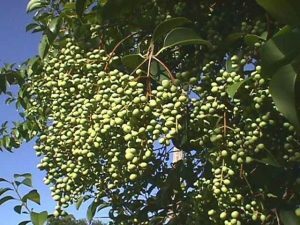 Therefore glossy privet has long been used for the treatment of osteoporosis in China and is a component of many herbal formulae for this condition. Active Constituents: The major active components are the oleanolic acids. Also present are triterpenes, secoiridoid glucosides, volatile components, fl avonoids and phenolic compounds. Only use during pregnancy under strict supervision of a health care professional. It has been used for morning sickness however there is not a large body of evidence as yet to prove its safety and efficacy.